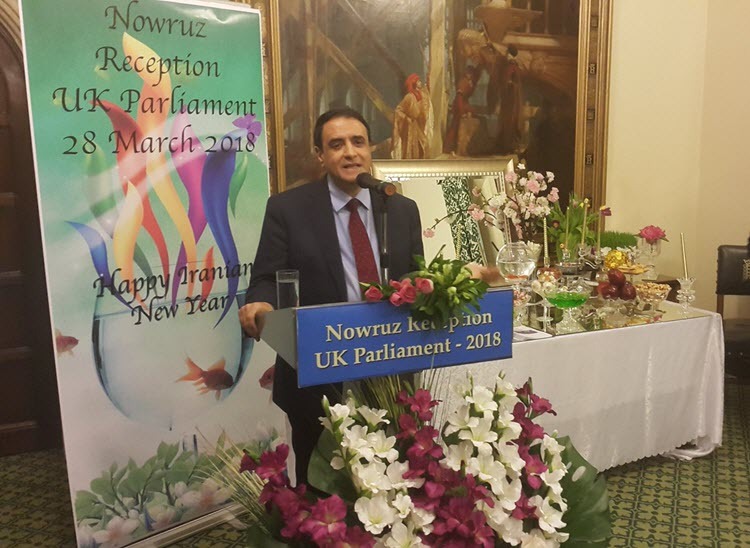 Cross-party members from both Houses of Parliament joinedmembers of the Anglo-Iranian community, jurists and human rights activists to celebrate the Persian New Year, Nowruz, at an evening reception in the British parliament on Wednesday, 28 March. Rt Hon David Jones MP read the Prime Minister's Nowruz message, and joined other parliamentarians in wishing everyone celebrating Nowruz festival, in Britain, Iran and around the world a happy Nowruz. He also expressed hope that the next Nowruz celebration will take place in a free and democratic Iran. Dr Matthew Offord MP, who chaired the event, pointed to last year's nationwide uprisings in Iran and said "the popular protests that have targeted the theocracy in its entirety is the beginning of a new era for the Iranian nation and a clear sign that the Iranian people desire genuine democratic change in their country in the coming Persian New Year." In a video message to the Nowruz celebration in the parliament, the President-elect of the National Council of Resistance of Iran (NCRI), Mrs Maryam Rajavi, thanked the cross-party MPs and Peers for their participation and invaluable support for the Iranian people's aspirations for freedom and Democracy and said, "This is encouraging for the people of Iran, particularly the youths who have risen up against the mullahs in recent months." "The people of Iran have risen up for regime change. The uprisings and protests are continuing. This development will bring freedom to Iran and security to the world. My compatriots, therefore, expect western governments, particularly the UK, to change their policy and take practical and concrete action to help the Iranian people", she said. Lord Carlile of Berriew CBE QC, co-chair of the British Committee for Iran Freedom, added, "We condemn the violent crackdown and arbitrary mass arrests by the Iranian authorities in response to the popular protests as well as the increasing number of execution in the country, especially the execution of juveniles in violation of international law. These atrocities expose the regime's inability to answer the legitimate demands of the Iranian people for improvements in their living standards and human rights situation in the country." Sir David Amess MP, co-chair of the British Committee for Iran Freedom said, "My colleagues and I have reiterated on many occasions that it was a mistake to decouple Iran's human rights abuses and support for terrorism from the nuclear negotiations. The Government should now work with our international allies to remedy the situation by proscribing the IRGC and impose sanctions on the regime for its ballistic missile programme. This is what the Iranian people expect from Western democracies, in particular the UK, as Mrs Rajavi said in her message today. " Speakers joined members of the Anglo-Iranian communities in calling on the Government to take concrete steps at the UN to refer the Iranian regime's abysmal human rights dossier to the Security Council in order to hold Iranian authorities to account for decades of systematic human rights abuses in Iran, including for the 1988 massacre of political prisoners. Hossein Abedini, Deputy director of the NCRI UK Office, said, "The Iranian people expect that their struggle for the overthrow of the clerical regime is recognised. I thank the members of parliament from all parties for supporting this legitimate demand ... The National Council of Resistance of Iran (NCRI) is striving to establish a republic based on the separation of religion and state and gender equality, as the President-elect of the Iranian Resistance emphasised in her Nowruz message." Baroness Harris of Richmond DL, said, "I add my voice to what my colleagues said today. It is essential that we from all political parties in the British Parliament support the Iranian people in their struggle against one of the most vicious dictatorships in the world for human rights, freedom and democracy."